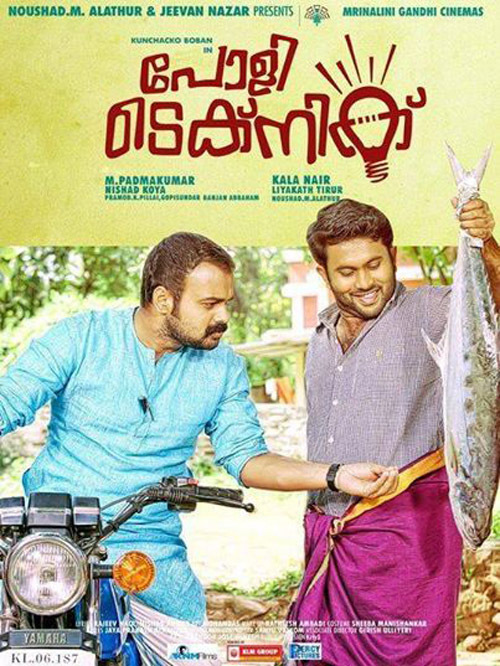 Director M. PadmaKumar for the first time attempts a comedic venture with his new film, Pauly Technique. The film is likely to face tough competition at the box office with Prthviraj’s 7th Day and Dileep’s ring Master releasing at the same time. Has Pauly Technique any ‘ technique’ that will give it a good run at the box office? The lead character Pauly is played by Kunchacko Boban. Bhavana is playing Aswathy the heroine of the movie. Other prominent cast members are- Aju Varghese (as Becker), Vijayaragavan ( as Sukumaran Nair) , Shiju , Devi Chanadana etc. Pauly is a good natured youth who as member of the communist party is involved with social work in his village along with his friends. The president of village panchayath Sukumaran cannot stand Pauly and they are often at loggerheads. However, Sukumaran’s daughter Aswathy loves Pauly. Pauly’s father, a commando is killed during a terrorist attack in Mumbai. Pauly receives a large sum of Money as Compensation. He wants to use that money to reopen a closed factory of the village but Sukumaran is determined to stop him. What happens next?? The cast of the movie delivers a good performance. Boban is great in his role. Aju Varghese also shines in his role. The script by Nishad Koya is interesting and is a plus point of the movie. There are wonderful light humor touches throughout the movie. The clean family bankruptcy help and entertainment nature works in favor of the movie. the director has done a commendable job in his first comedic film. The plot becomes predictable after a while. Some parts are melodramatic and dragging . the songs add nothing to the film rather hinder its flow. The movie is a good fun watch for the whole family.